Trying to be first with any news on Scott Speed's plans for the future has been quite interesting. To begin with, it confirmed my decision to position F1 Insight as an opinion blog, rather than a news site; one cannot compete with news services that receive preferential treatment from the original sources. Sure enough, the first I heard was from a Canadian newspaper site (of all places), closely followed by Planet-F1. I claim third place, however, which isn't bad, I guess. That was yesterday. Today all the sites have the story, of course, but note that they are, with one exception, mere reprints of the first press release. At least I had the decency to use my own words and reflect on it a bit. The exception was Autosport that split the story into two, one for Speed and the other for Liuzzi, and added the text from Scott's own announcement on his website. I told you they were the best. That will probably be my last adventure into the world of scoop journalism. It is much more fun to take the time to digest the news, put perhaps two stories together, and then pontificate on the whole thing. Which brings me, strangely enough, to GP2. I managed to get up early enough before the Hungarian GP to catch the full GP2 race and, to be honest, I was seriously underwhelmed by it. If that is a fair example of the wonderful racing that everyone hammers on about, F1 has nothing to worry about. 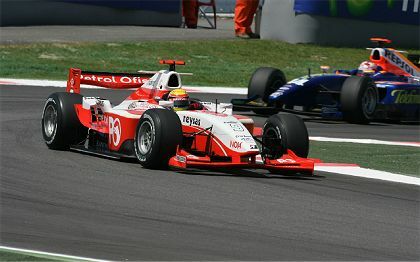 To me it looked amateurish, laden with silly mistakes, and the much-hyped Timo Glock was ordinary at best. It may be that I watched the wrong race; the Hungaroring is a pretty poor place to go motor racing, after all. But I doubt it. I was not expecting lots of overtaking and exciting needle matches - I was watching in an attempt to spot the talent that everyone says is present in GP2. Instead I was treated to plenty of clumsy passing attempts and entirely unassisted departures from the track to go farming. There was little sign of real skill although, taking into account the fact that the cars are very closely matched, some drivers seemed a little faster than others. I suspect that the problem is that the best drivers have already been taken up to F1. The "pinnacle of motor sport" had a bumper crop of rookies from GP2 this year and it may take time for more truly talented youngsters to make their way up from lower formulae to fill the gaps in GP2. And that may lead to the old F2/F3000 problem raising its head again. There has always been difficulty in designing a formula as a feeder series for F1. It seems that every new attempt works for a year or two and then tends to fade quite badly until the FIA is forced to try something else. If GP2 is going through the same process, F1 team managers will soon be sifting through the ranks of F3 drivers in the search for new talent and GP2 will degenerate into a formula for the guys who did not quite make it and the ones who never will. Bernie Ecclestone must be aware of this possibility for he is trying to encourage F1 teams to put more investment into GP2. But I think he may be embarking on a Canute-like quest against the tide in this. Talent is fairly obvious by the time it reaches F3 and team managers will always try to shortcut the process by grabbing the obvious future stars as soon as they appear. That may not be ideal for the development of the driver but F1 is a pitiless machine that soon spits out those who prove unable to adapt quickly enough. In these days of seemingly unlimited supplies of new talent, that can only become even more the case. Another hope for GP2 is that it will enable teams to make the jump to F1. But this is a forlorn hope indeed. With F1 becoming a manufacturers' formula, it will become almost impossible for independents to push their way into the club. Historically, new teams tend to come from the same place as star drivers anyway: Formula 3. I could be wrong about all this - it is all based on very little experience of GP2, after all. But it is hard not to see familiar patterns beginning to assert themselves and to imagine that we are going once more around the mulberry bush. Maybe the FIA should accept that any series introduced as a feeder to F1 will only work in that way occasionally and instead will become one for the nearly-men. Which is not the end of the world either; why shouldn't the nearly-men have somewhere to race too? i'm not sure i agree that autosport is the best, just because they split a story in two. they're experts at dragging a press release into as many headlines as possible, presumably to maximise their hits (and therefore their advertising revenue). not sure that's a commendable trait though. i agree with you that an opinion blog is the best way to be though. that's why i read this. to see what you think. Oh, I agree that's no reason to give Autosport the title of best news service, Sidey. When it comes down to it, much of what they do is regurgitation of press releases, just as the other news sites do - it was just that they actually managed to do a bit more on this occasion (even if it was just copy and paste from Speed's site). The real reason I think they're the best is because I have fond memories of Autosport magazine from the period when I subscribed to it (many years ago) - and it is the best motor sport mag by some distance. The practice of squeezing as many headlines as possible from one press release does amuse me, I must admit. At least they're showing that they understand the medium - most internet readers want short snappy articles and can't wait to get clicking again. And the search engines love it, just as you say. And finally, you warm the cockles of my heart to know that you read for my opinion. 'Tis the reason I visit Sidepodcast too, of course - to hear yours! Someone may beat you to the news but no one can have your opinion before you do! I'm glad to see Speed coming home, I think he will do great in Champ (if thats what he chooses). After reading your last post I see that at the very least there will be one more Champ Car fan, I just hope your not the only one. I do not have much chance to see the GP2 races, as no TV shows them here in Asia. But, I saw few of them live, on the tracks, and the show was pretty exciting. A new car has been introduced for next and few following seasons, that should add to the show. Ah, Milos, between us we demonstrate the well known fact that races are always more interesting in reality than on the television. There is no way that the TV can ever reproduce the sounds and smells and immediacy of actually being there. And you are probably right about my having watched the wrong race - as I admitted, the Hungaroring is not exactly known for its scintillating races. But why excuse the drivers for mistakes? These are guys who are one step away from F1, they have been racing in lower formulae for years, shouldn't they be getting the hang of it by now? I always had wondered what the fuss about GP2 was - it's F3000 with a Briatore-spec marketing machine and about three times the operating cost per team. Marketing a series better does not improve the racing, and I foresee it doing exactly the same thing as F3000. You'll always know that the ones at the front were better than those at the back, but you won't know whether the first one, first three or first none are ready for Formula 1. It's just more preparation. Ferrari and Toyota don't take rookies. McLaren only take rookies if they've chaperoned them through the junior formulae (Lewis was selected whilst still in karts, and the likes of Pedro de la Rosa and Gary Paffet joined the McLaren club on or before their F3 days). Honda/Super Aguri, Renault, Red Bull/Toro Rosso and BMW have their own staircases of talent. Honda and Red Bull have a select group of development drivers, BMW has a development series and Renault has both (actually, it has two development series in Europe, but never mind). Spyker have a gaggle of pay-testers, from which race drivers are selected (finances permitting). If finances do not permit, Johnny Payola is selected. Williams can't afford to invest in GP2. How many teams does that leave investing in GP2? Zero. Bernie's on a hiding to nothing, because the teams have already learned not to depend on feeder series to be reliable. They're treated more like getting a graduate job - you might graduate from university (read good junior feeder series) to get the skills, but you only get into a good uni if they rate your experience with organisations like them (read staircases of talent, testing or other selection method). That looks a pretty good analysis to me, Alianora. I listened to the hype about GP2 for a long time before finally taking a look for myself, so I suppose I shouldn't be surprised at being disappointed. Hype is hype, after all. The fact that Lewis Hamilton came through GP2, as well as some other very quick rookies, made me expect more, too. Even though I knew he'd been groomed for F1 by McLaren for so long, it was hard to resist the tales of his exploits in the second formula. Ah well, F3000 all over again, just as you say. The problem is that GP2 is too expensive for many young drivers. The result is that clowns like Jason Tahinci, Sergio Jiminez et all, fill up spaces on the grid. But, in case you are wondering, no Hungary was not exactly the best GP2 race there's ever been. I still think it provides reasonably entertaining viewing - I just don't think the talent is there this year. I was hoping you'd come along, Patrick - I know that you have much more in-depth knowledge of GP2 than I do and I was bound to learn a lot from you. Much of what you say confirms what Alianora said: that GP2 is too expensive to be an ideal feeder series for F1. Makes me wonder why it always seems to be the less talented drivers who have access to plenty of money - not always true, I know, but common enough. And, just as I suspected, it seems I watched the wrong race. I should have known that the Hungaroring would not be the ideal introduction to my education in the series. I think it is more of a comment on Vettel's manager than Vettel himself. Since Vettel was effectively on the BMW fast-track stream already, it was not necessary for him to be in GP2 for the sake of exposure (the BMW testing was exposure enough). As a result, the most important thing was to guarantee winning and good results. If it's easier to do that in a slightly-lesser but still highly-rated series than in GP2, that's what any savvy driver manager would advise. I'm not sure about Vettel, to be honest. He came off second-best to Di Resta in Euro F3, and he's not particularly stood out in WSBR. Good, undoubtedly, but not necessarily head and shoulders above, say Buemi. He did ok in the BMW at Indianapolis, but it wasn't exactly a Schumacher in a Jordan in 1991 performance was it? There's too many formulae just below F1, I think. WSBR, in particular, would not exist in my idea world, as it diverts some of the best juniors away from GP2. Why is it always the more mediocre drivers who have the money? Because only the pretty exceptional ones get anywhere *at all* without it. How many F1 drivers from 'modest' backgrounds have there been in the last 20 years? the Schumachers, Raikkonen, perhaps Hamilton, Alonso, and that's about it, as far as I'm aware. I guess we'll see how good Vettel is soon enough, now he's in Speed's car. But that's a very good point about the number of formulae below F1. I admit that it confuses me and I preferred the days of a clear pathway - F3, F2, F1, even though many missed out F2. The existence of the Formula 3's makes me wonder why there is a GP2 series in the first place. Especially consider, that I think some time over the winter there were rumors that Bernie wanted to try a GP3. For what GP2 is, it's not rubbish, but it's not really supposed to attract spectators in droves, either. The series now known as ChampCar Atlantic (in the CART days, Toyota Atlantic Series) has typically been a festival of unnecessary bumps and wrecks, forgotten lugnuts and botched wing adjustments. GP2 doesn't look that much different. I think the wise way for F1 teams to use GP2 will be to make sure their test drivers remain active during Gran Prix weekends; the rule changes about two cars during testing means that the testing men lose out. The notion of using GP2 revenue to eventually fund a Formula 1 effort is a nice idea on paper, but the cost of running a GP2 team can't be that much in comparison to the gargantuan budget required to run a competitive F1 effort. Yesterday I watched a video of last year's Macau F3 GP and it was much better racing than the GP2 race in Hungary. I can understand why many drivers choose an alternative route after F3, having watched that. Maybe GP2 has its place - there is a case for a large-engined formula just below F1 after all, but I think drivers will always graduate from other formulae too.